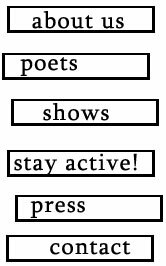 Poetic People Power was founded by writer Tara Bracco in 2003 to create an ongoing project that combines poetry and activism. Each year, a diverse group of poets are commissioned to write new works about a political or social issue. The new poems are then presented to a public audience in a professional spoken word show. Poetic People Power entertains and informs. It raises awareness on specific topics and engages audiences through the expressive art of poetry. Previous shows include Women's Words About War (Bluestockings Bookstore, 2003); Voices on Voting and Democracy (Ars Nova Theater, 2004); Coming Clean: Poems for the Earth (Bowery Poetry Club, 2005); Raise the Wage (Nuyorican Poets Cafe, 2006); Sick & Tired: A Call for Universal Care (Bowery Poetry Club, 2007); Activism: The American Way (Bowery Poetry Club, 2008); Tapped Out: Words About The Water Crisis (Bowery Poetry Club, 2009); Price Check: How We Became A Culture Of Consumption (The Producers Club, 2010); The Revolution Will Be... (Nuyorican Poets Cafe, 2011); Retro-Active:10 Years of Poetic Action (Helen Mills Theater, 2012); Invisible Chains: Inequality in America (Wild Project Theater, 2013); Closed: NYC Shuts Its Doors To Artists (Theatre 80, 2014); #AntiSocial: The Dark Side of Social Media (Wild Project Theater, 2015); Take Your Time (Theater on Waverly, 2016); While We Were Sleeping (Dixon Place, 2017); and Agitate: 15 Years of Poetic Action (Helen Mills Theater, 2017). What art will you make? To date, this project has produced 16 shows and commissioned 100 poems by 35 writers. We are thankful to the following people who have generously offered their guidance, talent, time, support, or expertise to help make this project a success over the years: Sarah Grace Anders, Ben Arredondo, Kimmi Auerbach, Lyndsey Barratt, Tom Block, Bluestockings, Roseanne & Denis Bracco, Jan Buskar, Joe Cairo, Gabriella Callender, Cap 21 Studios, Dan Caplan, Ximena Castillo, Tyler Christie, Helen Churko, Sally Clark, Pete Davis, John de Graaf, Jill DiMartino Photography, Ragon Duffy, Jason Eagan at Ars Nova, Nadine Ezra, Ashley Faison, Daniel Gallant, Jennifer & Christopher Gandin Le, Stephanie Genkin, Jodi Gibson, Isabella Gomes, Joe Gonzalez, Chris Grace, Kayte Grace, Alyson Greenfield, Suzanne Grossman, Andrea Hance, Kathleen Hoff, Bob Holman & Matt Lydon at Bowery Poetry Club, Samantha Inesta, Jennifer Jones, Jim Joseph, Jeremy Karafin & the Wild Project Staff, Becky Katzman, Kristen Kemp, Sid King, Russell Lerner, Julia Levine, Brooke Linville, Frank Lopez, Liz Maestri, Alane Marco, Danny Matos, Willow McCormick, Megan McGibney, Keri Meoni, Michele Miller, Darren Molovinsky, Jessica Morton, Melissa F. Moschitto, New Georges, Michelle Ngo, Nola Studios, Toks Olagundoye, Mitchell Ost, Melanie Paccillo, Sandra Pons, Florence Poulain, Leah Rae Photography, Susanna Rasmussen, Dana & Auguste Roc, Gussie Roc, Kelly Roberts, Colleen Rodd, Mark Rywelski, Andrea Sparacio, Kristine Schlachter, Shetal Shah, Nicole Shore, Jessica Slawson, Renee Smith, Robin Stern, Fran Tarr, Jacquette Timmons, Theaterlab, Joe Trentacosta, Jason Tseng, Jennifer van der Meer, Mollie Van Gordan, Natalia Vargas-Caba, Chauncey Velasco, Jonathan Walton, Marc Weisman, Angela Williams, Kryssy Wright, Justin Woo, Woodhull Institute, and Shandra Woworuntu. Most of all we thank the awesome poets who have brought their rage and creativity to our stage!